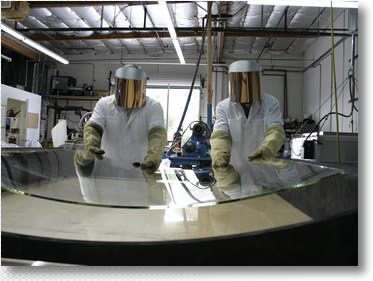 Custom Glass Molding: Precision Glass Molding Manufacturer | Rayotek Scientific Inc.
Rayotek is one of the most advanced and unique glass molding facilities in the U.S. We can mold, slump and shape standard flat borosilicate (Pyrex™), soda lime float glass, fused quartz and other exotic sheet glasses into precision curved shapes. The quality of our molded glass blanks is on par with traditional ground and polished parts. 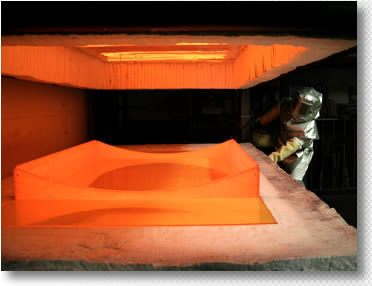 In comparison to ground and polished parts, glass molding offers: faster production rates, better surface quality for coating, larger sized molding capabilities and significantly lower manufacturing costs. Our automated glass press systems are for very high-volume, low-cost manufacturing of precision glass and borosilicate products.